Difficult People … or Difficult World? We have all met them. People who just rub us the wrong way … who get our back up … who we just want to say or do something to in order to let them know we do not like them, don’t approve of them, their choices, lifestyle … whatever. In fact, as books, television, movies and the news show us, many of us even have family members we just can’t stand … and for some people their feelings about other family members even motivate them to commit crimes, even murder. But are people being difficult for the sake of being difficult? Are people you consider difficult really difficult … or just different? And how much different? 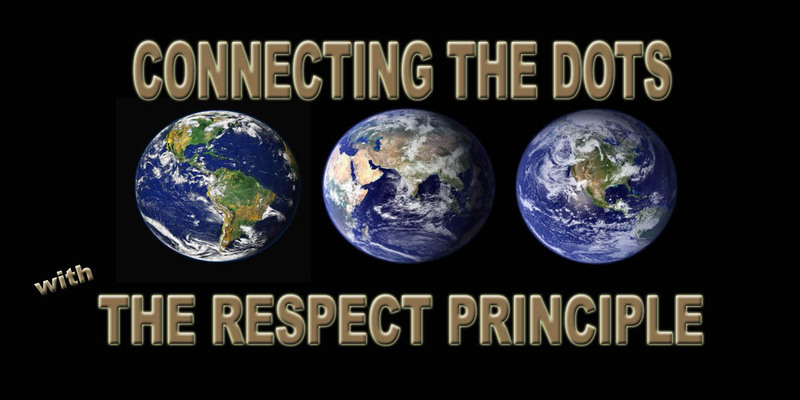 In Connecting the Dots … with The RESPECT PRINCIPLE, my goal was to transform and provide a wealth of knowledge from the various fields of academic study and present them to our youth and to those who do not spend their time reading academic or even popular culture books. As a result, one of the key components of the book presents the Myers-Briggs Type Indicator (MBTI) … a psychological profiling tool used by organizations and high-level academic institutions to help them secure the people with the personality type, along with other factors, best required for the role they need filled. Initially proposed by Carl Jung, one of the two forerunners of psychology, the other being Sigmund Freud, Jung suggested there were several personality types and then later, the team of Myers-Briggs took his work and made it more accessible as a psychological assessment tool. Later, other teams, such as consultants Paul D. Tieger and Barbara Barron-Tieger made the psychological tool more accessible with their books Do What You Really Are and The Art of Speed Reading People. The core of the MBTI is there are sixteen personality types, though primarily divided by two main key elements that are supported by other components. The key element defines how a person experiences the world as a result of the way their brain functions and processes information. Introvert brains are highly stimulated internally and as a result, they require quieter, more removed from the mainstream work and living environments to thrive. Extrovert brains have a much lower internal stimulus level and as a result, thrive when their environment, is bustling and filled with data their brains covert into knowledge. You can read more about the MBTI in my book, Connecting the Dots … with The RESPECT PRINCIPLE or in the previous authors works, but for now, let’s just consider the accessible knowledge there are sixteen personality types, plus all the other influences of family, community, culture, financial status … plus what I call the Disrespect Philosophy that drives our unconscious conditioning, motivating us to think that a person should have to “earn or be awarded” respect … to be valued for just being a life. Difficult only though because one, we have been taught to not value others not like ourselves and two because, until now, we had not connected the dots to see each other differently from ourselves … and to accept not everyone has to be like us. Seeing “difficult” people through this new lens empowers us to positively change our thinking, our words and of course, our actions. So what if we don’t like someone or approve of them? With our own increased awareness that boosts our own RESPECT LEVEL we learn our feelings or thoughts are not cause to hurt or harm with gossip, judgment, neglect or with physical violence. We learn we are just different and that difference is good, even great! Great because acknowledging our differences empowers us to more fully develop our differences, which is our potential, and as a result, to become more realized individuals … and citizens. Difficult people? No. Just a difficult world shaped by the negative, limiting and harmful Disrespect Philosophy and supported by a lack of knowledge … till now. All rights reserved by KAITLIN A. TREPANIER/ DARK HORSES PRODUCTIONS … Creative Writer, Visual Artist and The RESPECT Specialist, architect of the global initiative Connecting the Dots … with The RESPECT PRINCIPLE … because every child … every person … should know, by their own experience, they are valued … RESPECTED.